Thanks to the technological inventions that some services like shaving can be done at home with your own machine instead of visiting a barber. One of the most recommended shavers on the market today that you can use at home is the Panasonic ES8103S Arc3 Men’s electric shaver. It is a reliable and safe to use device since you can use it either on the dry or wet skin. The head of the shaver is flexible such that you can move it to different positions for better shaving plus it is designed in a cordless form. Which means that you can shave from any corner of the room. Panasonic company has been in the industry for a long time and they are known for making the best shavers all around the world. They have various Arc3 shaver models and in 2016, is when they upgraded their model to this new and magnificent ES81103 Arc3. Since its release, the shaver has hit the market with great impact due to its performance and the reliability as well. Considering that you can use it on dry or wet skin makes it ideal for people with skins that are sensitive. When it comes to quality and reliability, this kind of shaving device wins above all of them. First off, it is ideal for both dry and wet shaving. This shows that this is a shaving device that is designed for all including the people with sensitive skin. It does not cause any skin reaction whatsoever. Also, the shaver is ideal for people who want to grow different styles of the beards thanks to the presence of the pop-up trimmer which is ideal for shaving different styles of the beards such as the mustache, long beards and also the sideburns. The shaver can be used by travelers or at home because it is easy to carry around. The packaging comes with a carrying bag which makes it easy to carry around and the device is cordless which allows you to use it at any area in the room as long it has charge. Also, it is light in weight thus carrying it is pretty much be easy. The shaver requires to be recharged after long use thus if you are in an area that does not have an electric connection, this device is not ideal for you. For those looking for a cheap shaver, Panasonic ES8103 S Arc 3 is not the right device for you since it costs more than 50 dollars which is the price range for the cheap shaving machines. But, if you are looking for quality in a shaver, well, the shaver is worth every penny as it guarantees you long use. The use of the shaver is quite easy since the features are skin friendly and it is shipped with a user manual for easy instructions follow. The packaging consists of the actual shaver. The shaver uses a rechargeable battery and for easy charging, one is provided with an AC adapter. There is a carrying pouch which is used for carrying and packing the shaver in the case of when you are traveling. • It has a top foil shaver cover. Such devices require a cleaning tool to help in eliminating all the hair parts that may be stuck on the blades but unfortunately Panasonic arc 3 does not come with any cleaning equipment. This makes the cleaning process of the gadget to be difficult. It does not come with a charging c-dock which makes it difficult to charge in various power sources. The blades are ideal for giving quick and comfortable contour shaves. The pop-up trimmer is ideal for use by people who want to grow some beard on their faces. It helps in shaping the mustache, beard and also the sideburns. The screen is equipped with the device to show the status of the battery such that one is able to notice if the charge is running out. This allows you to either shave after a shower or even before showering. 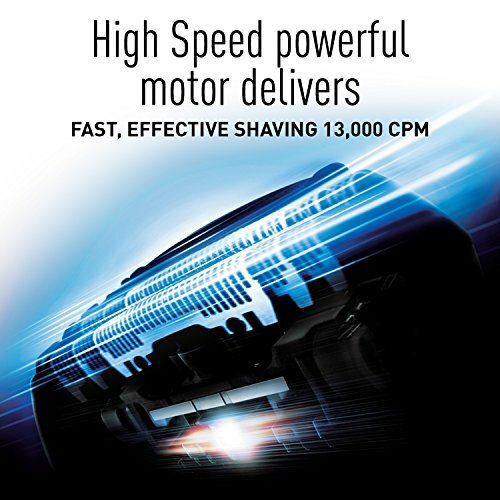 The high performing motor allows one to deliver up to 130000 shaves in one minute. It can be used for both dry and wet shaving. It is cordless which allows free movement. It comes with a pouch for easy traveling. It costs fewer than 100 dollars. It is not packed with cleaning tools. It is not sold with a charging dock. Aside from this shaver being manufactured by one of the leading companies in the world, it is also made with excellent features that will make your shaving to be efficient and easy. 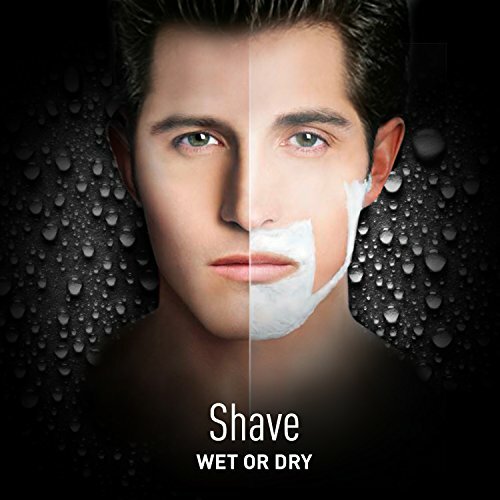 Also, the device is quite safe to use considering it can be used for both wet and dry shaving. Although the price may not be classified among the cheap shavers, the overall performance and features of the device are of high quality.